It seems like a huge task to restore Malaysians' standard of English but it can be done if we put our hearts to it. IN November 1996, a Saudi Arabian Airlines 747 jet collided with an Air Kazakhstan cargo plane near New Delhi, killing 349 crew and passengers. Investigations later revealed that the accident was partly caused by the Kazakh pilots' insufficient fluency in English in understanding the instructions given by air traffic controllers. Needless to say, this was only one of the several plane accidents which had been caused by the pilots’ poor command of English. Today, the rules of the International Civil Aviation Organisation require all pilots to be fluent in English. So just imagine what will happen if our Malaysian air traffic controllers and pilots are not sufficiently proficient in English. This will no doubt bring dire consequences. English is not just the lingua franca of civil aviation, but of the world. In this Internet age, it is also the lingua franca of the Web if we want to stay connected with the world, and avail ourselves to the colossal amounts of online information. In the 1960s and 1970s, we Malaysians were credited for having a supreme command of the English language in the region. Then, we had no lack of personalities like R. Ramani, a former Permanent Representative of Malaysia to the United Nations and president of the Malaysian Bar. His impeccable command of English, both written and spoken, often impressed the world body and made our nation shine on the international stage. Alas today, you and I know the sad state of English among Malaysians. I pray that we will not reach a time when all our air traffic controllers and pilots have to be expatriates because of our horrendous standard of English. As for me, learning and improving one’s command of English is also very much a personal effort. The government and teachers can only help to a certain extent. A lot of it still depends on one’s determination to learn and improve by constantly speaking and writing the language. I attended an English primary school in Yong Peng. In the 1970s, it was still a rural village. 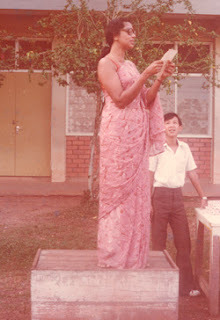 During my time, all subjects were already taught in Bahasa Malaysia except for Mathematics and Science before a total switch to Bahasa Malaysia in the 1970s. The switch then only involved the national schools and not the vernacular schools. Entering Form Four, if one chose to study in the Science stream, it was as good as studying in an English school because General Mathematics, Additional Mathematics, General Science, Pure Science, Chemistry, Physics and Biology were taught in English. For those who chose the Arts stream, subjects like History and Geography were taught in Bahasa Malaysia. In the 1970s, Yong Peng was still a rural village. As my parents were illiterate, learning English, particularly understanding the English grammar, was a great struggle. The problem was compounded because my classmates, particularly those from Chinese primary schools, preferred to speak Mandarin. Despite having spent one year in the Remove Class, most of them were still very weak in English. Consequently, we would first think in Chinese before forming our sentences in English, resulting in many of us speaking and writing broken English. I still recall with fun, for example, some of them calling “godson” as “dry son” since in Chinese, a godson is called gan er zi! Looking back, I understand now the frustration of some English teachers who, at times, had to resort to using a little bit of Hokkien or Mandarin when explaining the English grammar and vocabulary. Of course, the moment this was done in class, many faces would quickly brighten up indicating that they now understood what the teachers were talking about! I am, therefore, not surprised if teachers in rural areas today have to resort to use, perhaps extensively, Mandarin and Bahasa Malaysia when explaining English grammar and vocabulary. It is, therefore, fallacious for some to identify only Malay students as being weak in English. During my secondary school days, the main challenge came whenever there was an inter-school meet at district or state level. I observed many of my schoolmates would feel inferior and inadequate when mixing with students from better schools due to the poor command of English. As the head prefect, the duty fell upon me whenever a school representative was asked to address the occasion. I must say there were several occasions when I was laughed at because of grammatical mistakes or pronouncing some words incorrectly. But that did not deter me from continuously wanting to better my English. I guess being laughed at and ridiculed was the best learning method because after suffering from the embarrassment, one would not possibly repeat the mistakes. At this juncture, I must pay tribute to three of my English teachers Yap Teong Hoon, Rose Anne Easaw and Lau Yen Fung whose passion for teaching had given hope to a rural student like me to build a strong command of English. I still remember the day before I had to deliver my speech as the President of the Interact Club before a group of Rotarians from Batu Pahat, and Easaw, as the teacher-in-charge, spent hours helping me with the delivery, taking pains to teach me how to pronounce words like ‘sincerely’, ‘enthusiasm’ and ‘conscientiously’ correctly. In those days, it took me at least five hours to finish an English newspaper because of my poor vocabulary. I then started having a little book, jotting down all the new words I had learnt and used it whenever an occasion arose. I would always look at the book again, even waking up in the middle of the night if I had forgotten the meaning of a word. Parents these days must make it a habit for their children to read English newspapers because it is indubitable that this is an indispensable tool to learn English. Two books were of great help to me: Word Power Made Easy by Norman Lewis and Common Mistakes In English by T.J. Fitikides. Joining the English Youth Fellowship of the St Stephen's Church in Yong Peng as well as the singing of hymns and studying the Bible with English-speaking adults also helped immensely. It can be quite distressing at times to notice that even some senior lawyers are not able to differentiate between simple pairs of words, such as borrow and lend, come and go, principle and principal, and dependent and dependant. The other common mistake committed by lawyers and journalists is the word ‘counsel’ which means ‘an advocate or advocates’ which must be used with a singular or plural verb. Hence, we do not describe two advocates as two counsels, but two counsel! But nothing can be more stressful than to see lawyers incapable of grasping basic grammar concepts, especially with when to use the basic form of verb. Take for example, ‘eat’, ‘ate’ and ‘eaten’. ‘Eat’ is the basic verb. ‘Ate’ is past tense and ‘eaten’ is past participle. Forget for a moment the various grammatical terms used, one must forever remember to use the basic form of verb after - to, let, can, cannot, could, could not, may, may not, might, might not, must, must not, shall, shall not, should, should not, will, will not, would, would not, does, does not, do, do not, did, did not and ought to. As for past participle, it comes after – be, being, not being, been, not been, am, am not, is, is not, are, are not, was, was not, were, were not, has, has not, have, have not, had and had not. Similarly, it is most disappointing to notice a sharp decline in the standard of English among our students and teachers in local universities these days, particularly law students and law lecturers. A few years back, I was shocked to discover law examination questions set by a local university containing many grammatical mistakes. Of course, if law students these days are also judged on their command of English when answering examination questions, I think many would flunk! I must add that grammatical mistakes committed in legal documents can have serious implications. Take for example, the Freedom of Information (State of Selangor) Enactment which was published in the Government Gazette on July 2, 2010. Clause 7(1) states: “Every department shall response to the application ”. The grammatical mistake is obviously the word “response” which is a noun. As explained above, one must use the basic form of verb after the modal verb “shall”. In this case, the proper word is “respond”. It follows, if the enactment had been passed by the Selangor State Assembly without any amendment, this mistake can only later be corrected by way of an amended enactment. Finally, I have now come to the most important point, that is, it did make a huge difference to me during my time when Mathematics and Science were taught in English simply because students had more opportunities to use and exposure to the language. I, therefore, support the call that these two subjects should continue to be taught in English, at least in selected schools. It is pivotal that our education system must not be allowed to progress at the pace of the slowest learners if we want to achieve excellence. It is illogical to say that we must revert to teaching Science and Mathematics in Bahasa Malaysia in all schools because students in rural areas are not able to cope with it or compete with those in urban areas. If we do that, we are only perpetuating mediocrity and not moving towards excellence for students to have a chance to become world-renowned doctors, scientists, engineers and lawyers. It will also be the greatest disservice to the nation to brand such students who want to learn Mathematics and Science in English as ‘elitist’! While it appears to be a gargantuan task to restore Malaysians' standard of English to the glorious days of the 1960s and 1970s, we must not lose hope. The elixir to the problem is simple just let our hearts and minds follow the old true saying, where there is a will, there is a way! *This is the expanded version of the article published in The Star on April 11, 2011. Dear Mr. Roger, thanks for another well-written article. I always believe that no one is perfect, whats more, Malaysian's English proficiency. Of cause, it is up to individual whether to stick to current standard or strive for betterment! Hi Karming, You may like to know it is spelt 'Of course' and not 'Of cause' unless it is a typo error. Many Malaysians adopt mediocrity mentality -- so long others can understand what is talking, it's considered OK. The borderline of official correspondence and casual email is no longer distinguishable for many Malaysians. Striving for excellence and appreciating the beauty of English/Chinese/Malay literatures are no longer emphasized. The function of language has been demoted as a tool to make more money and no longer a tool for better communication. By all means, please go ahead. Thank you. Wow, what a great post. I am Polish teacher of English and I first started learning English when I was 12. English is taught in schools in Poland but it doesn't mean that people who graduate know how to speak & use it. I've got my Masters Degree in English and now live in Wales, UK. It is still quite difficult sometimes for me to understand all the accents. People who are taught a foreign language in their native countries don't always realise how difficult real,live language is. They think they know it, but in fact, if they were faced with a native speaker, they would most probably have communication problems.